Thia is the reverse of the leaflet. This is an advertisement for the Bradford Manufacturing Company’s dress fabrics. The leaflet is beautifully illustrated and depicts a working class woman standing in front of a loom. At the beginning of the 19th Century, most people's clothing, rich and poor alike was either home made or made by tailors or dressmakers. Fabrics and accessories were bought from draper’s stores or manufacturers like Bradford and the clothes were then made for the individual following a fashionable pattern. 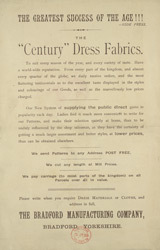 The leaflet also highlights the variety of fabrics available from wool and cashmere to twill and tweeds, there are even 2 samples glued to the leaflet.